Hundreds and possibly thousands of deported veterans reside south of the border, separated from family and the country for which they were willing to risk their lives. Most of these veterans have been honorably discharged and decorated. The biggest mistake made by these veterans is that they did not apply for naturalization when they had the chance. A naturalized citizen generally cannot be deported but a permanent resident who commits an “aggravated felony” can be removed from the U.S. even if he or she served honorably for his country. At one time, if a permanent resident was convicted of a deportable crime, they could apply for a waiver of deportation and be allowed to stay in the U.S. In 1996 however, Congress overhauled the nation’s immigration laws and expanded the list of deportable crimes described as aggravated felonies and eliminated the waiver. As a result thousands of residents, including veterans, were removed from the U.S.
To avoid the risk of deportation, an immigrant member of the military can generally apply for naturalization after one year of active duty during peacetime. Military service during times of hostility provides an immigrant a chance to apply for naturalization immediately. Since September 11, 2001, the U.S. has been under a period of hostility. However, many military immigrants do not seek naturalization when the opportunity arises. Most of the deported veterans never imagined that their country of service would banish them. The U.S. government has failed veterans in many ways. Minority veterans comprise approximately 43 percent of the total California veteran population. Veterans are plagued with many stress factors when they return home after serving in combat. For example, less than half of the country’s 21.2 million veterans were employed in 2014 according to the Bureau of Labor Statistics. In Los Angeles County alone, it is estimated that 20 percent of the homeless population are veterans. According to the U.S. Department of Veterans Affairs (VA), about 70 percent of homeless veterans suffer from substance abuse problems, and some 45 percent are suffering from mental illnesses, including Post-Traumatic Stress Disorder (PTSD). In order to be discharged from the military and receive disability and health care benefits, service members must navigate the complex disability evaluation process. Given the bureaucratic nightmare, many veterans are delayed from receiving crucial care. Of the thousands of veterans that have successfully navigated their way through the VA system, 20 percent of them have been reported to have PTSD. PTSD symptoms also may come and go over many years. It is not uncommon for folks to cope with their PTSD symptoms by drinking heavily and using drugs which can lead to violent behavior. According to the VA, one in ten veterans of the wars in Iraq and Afghanistan has problems with alcohol or other drugs. Additionally, there is a systemic problem with providing the necessary benefits to returning veterans. Veterans often have to wait a long time to get necessary medical care. Internal VA audits found more than 120,000 veterans across the country were left waiting or never received requested medical care. If that is not bad enough, the Army has been criticized for avoiding PTSD diagnoses in order to pay out fewer benefits. Multiple immigrant veterans who did not receive timely treatment were convicted of certain alcohol, drug, theft or violent crimes and eventually deported. Many deported veterans without family in Mexico found refuge at the Bunker in Tijuana. Many of these deported vets that have been living in Mexico for some time may now be eligible for naturalization given recent decisions by the Supreme Court. Since 1996, several Supreme Court rulings have reversed the Department of Homeland Security’s interpretation of certain sections of immigration law. As a result of these decisions, veterans once deported as aggravated felons may now be eligible for naturalization since the crime may no longer be considered an aggravated felony. For example, a conviction for driving under the influence of alcohol is no longer an aggravated felony, and a state controlled substance offense must be punishable as a felony under federal law in order to be considered an aggravated felony. More recently, the Court has ruled that a second or subsequent simple drug possession conviction did not qualify as an aggravated felony and, and neither did the “social sharing of a small amount of marijuana.” Before these cases made it to the Supreme Court, large numbers of immigrants had been deported as aggravated felons for these crimes. Members of the U.S. armed forces (including the Selective Reserve) who serve honorably for any period of time during specifically designated periods of hostilities, including, WWI, WWII, Korea, and Vietnam or other periods of hostility are eligible for naturalization. The applicant need not be a lawful permanent resident if at the time of enlistment or induction he or she was physically present in the U.S. or on board of a U.S. owned and operated vessel used for noncommercial service. To be eligible for naturalization, a deported veteran must establish that he or she has been, for at least one year prior to filing the application for naturalization, and continues to be, of good moral character. The applicant must show, however, that he or she has not been convicted of an aggravated felony. Therefore, if a veteran has been deported for committing an aggravated felon and the Supreme Court has since held that the particular offense no longer is, the deported veteran may be now eligible for naturalization. 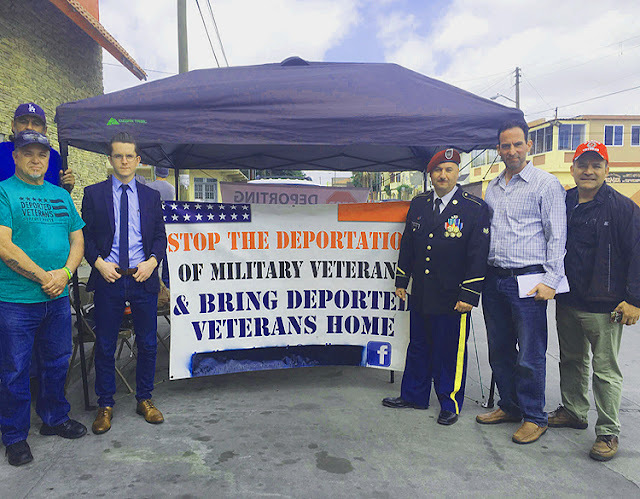 Deported veterans that do not benefit from a subsequent Supreme Court decision should seek qualified counsel to investigate and determine whether the underlying conviction can be vacated if a constitutional or statutory right had been violated. It is not unusual for an immigrant to receive ineffective representation in criminal proceedings. The Supreme Court also addressed that issue in recent years. If the deported veteran makes it back to the U.S., it will be understandable if he now prefers to sing along to Los Tigres del Norte’s De Paisano a Paisano.